Okay, so after the reading all the great reviews, I had, maybe not huge, but some expectation. 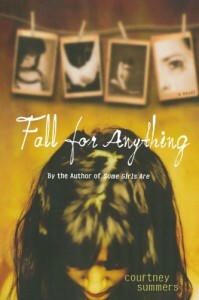 This was my first book by Courtney Summers. And it wasn't bad but I'm not satisfied either. The writing is way beyond awesome. Its like beauty in motion. So, no complains there. But I didn't get Eddie Reeves, the protagonist. She's messed up, understandably, after her father committed suicide by jumping off the roof, and wants to know the reason behind it. She really needs to sort her feelings about her best friend Milo(what is with the names? Milo, seriously?). She's crazy jealous ,or insecure maybe, when his ex shows up. But when he kisses her, she gets all awkward and stiff. So, I didn't get that. And then she keeps climbing roofs, to understand God-knows-what. And I still don't understand why she keeps saying her hands are dying. So all in all, frustrated as hell with the protagonist. Its a light read with raw and intense emotions. The characters(except Eddie) feel real and close to you like you know them. The story line, I guess, is pointless and the ending vague.